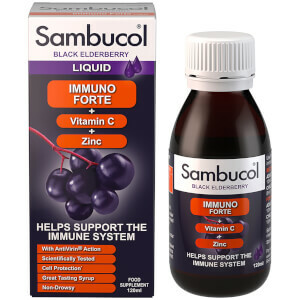 Sambucol Immuno Forte is a health supplement that helps to support the immune system. With an AntiVirin® action, it's rich in vitamin C, zinc and antioxidants which can help to boost your body's natural defences. Featuring a delicious black elderberry flavour, the non-drowsy supplement is free from alcohol and gluten. Suitable for ages 3+. - L.M.